One of Dubai’s favourite hotels, the Oasis Beach Hotel Dubai was officially closed on Aug 29 2008, a sad day for many satisfied guest who stayed at the 4 star hotel, with the 5 star service. Oasis, a Dubai Discount Hotel? One of the remarkable aspects of the Oasis Hotel, was that it was the only 4 star hotel on Jumeirah beach in Dubai. Surrounded by the super luxurious 5 star hotels, it enabled many visitors to Dubai to enjoy the finer thing that this wonderful city has at a more modest price. The good news is that the owners of the Oasis Beach Hotel, Jebel Ali International Hotels have a number of other hotels in their portfolio, including the Oasis Beach Tower Apartments, which are two, three and even four bedroom Luxury serviced hotel apartments in one of Dubai Marina’s most incredible towers. The apartments have independently managed restaurants: Ankie’s Italian Bar & Grill and Wagamama and 1 Bar: Mai Thai Trader Vic’s Lounge. The apartments have a pool deck and all this a few minutes walk from the beach. From the Oasis Beach Tower Apartments you can enjoy views over the Arabian Gulf and Dubai Marina and inside they offer spacious living areas, fully equipped kitchens with designer crockery and cutlery, a washing machine and dryer, an espresso machine, toaster, microwave oven and a large fridge-freezer. Perfect should you wish to stay in for the evening or ideal for a family breakfast. Guests may use the resort’s facilities, these include a range of water sports, a nice swimming pool with a swim-up bar and a children’s section and an outdoor Jacuzzi. There is a complimentary gym, tennis, volleyball and table tennis. The hotel doesn’t have a spa, but it does feature a massage room, sauna, steam room and hair and beauty salon. The apartments also feature an in-room safe, a flat screen TV, DVD player and a music system as well as three daily complimentary shuttle transfer to Jebel Ali Golf Resort & Spa. FREE NIGHT OFFERS at the Oasis Beach Hotel Dubai: Stay 4 nights pay 3. Valid when travelling between 09 Jan 09 to 17 Apr 09 inclusive. Stay 7 pay 5. Valid when travelling 07-20 Feb 09 only. Stay 5 nights pay 4. Valid when travelling between 18 Apr-23 Jul 09, 22 Aug-30 Sep 09 and 05-25 Dec 09. Ok, so the topic of skiing on a Beach Holiday website is a little strange, but not only is it possible to go skiing on your sunny beach holiday, but you can also go skiing in Dubai on your beach holiday! Dubai continues to render me almost speechless as they have what is said to be the largest indoor ski resort in the world…and all in the middle of the desert! The Ski resort in Dubai is so large that it has five different runs, all varying in difficulty and they have the world first indoor black run or you can trundle down a gentle slope, ideal for beginners and children. The longest ski run in Ski Dubai is 400 meters long and over 60 meters high. That is the length of 4 football fields! Snowboarders are also catered for as there is a Freestyle Zone to practice stunts … flips and what ever else snowboarders get up to! Don’t worry if you have never skied before, don’t worry as every level of skier and snowboarder is welcome, as well as the skiing, your children and probably you will also enjoy the largest indoor snow park in the world, which at 3000 square meters is the largest indoor snow park in the world. Ski Dubai also have qualified professional instructors at hand should you need any help or tuition on learning to ski or snowboard. Ski Dubai is a great way for you to drop off the kids (men included) in your family and head out to do some serious shopping in the most incredible shopping complex, as not only is the indoor ski resort in Dubai said to be the largest in the world, but it is also part of the Mall of the Emirates, which also just happens to be one of, if not the largest shopping complexes in the world! Besides from looking a little strange carrying skiing equipment and clothing onto a flight to Dubai, it is also heavy and bulky. Don’t worry, Ski Dubai has winter clothing, ski and snowboard equipment all available at the resort. Apart from the skiing, there are also two restaurants within the Dubai Ski center: One called the Avalanch Cafe is halfway down with excellent views of the slope. 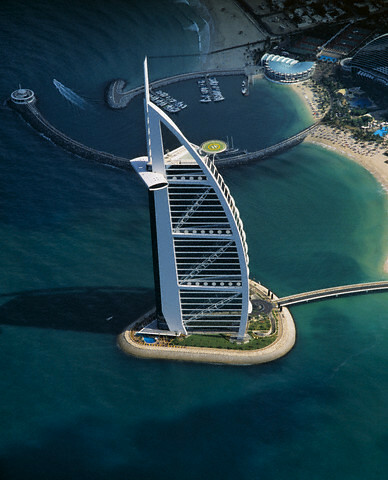 We have recently added a new page to the Dubai holiday section of the beach holiday guide: Dubai: Cheap Holidays, Flights, Hotels & Car Hire – a bit of a mouthful I know, but the idea is to have all the best travel agents and tour operators who have services that operate out of or to Dubai in one place. Making it much easier and quicker to compare prices. The Beach Holiday Guide will continue to expand the section by adding new travel agents, airline, hotel or car hire companies for Dubai that we find useful but must also be able to book online.